I have just created a new Quirkology video – this one has some rather unusual illusions in it, including a lovely colour-changing ring and some vanishing pencils. I hope you like it – what is your favourite one? The world’s first mind reading tee shirt is back! A few years ago we created the world’s first mind reading tee shirt. They were only available for a very limited period of time. Well, the good news is that they have just relaunched and are available for the next 4 days. Here is a video about it and the links. Enjoy! We have just released a new ’10 bets that you will always win’ video! This is actually one of my favourites and has lots of bets that are tucked away in obscure books. Oh, and the first one with the soda can is MUCH harder than it looks! It’s that time of the year again. Right now millions of people will be making their New Years Resolutions in the hope of creating a new and improved version of themselves. I am all for it. However, my work shows that only about 1 in 10 people will make their dreams a reality. Why? Because we often don’t know how to change our habits. In 59 Seconds I describe a large-scale study that I carried out into the techniques used by people who managed to make change stick. Here are my 10 top tips, and a little video…. 1) Make only one resolution, your chances of success are greater when you channel energy into changing just one aspect of your behaviour. 2) Don’t wait until New Year’s Eve to think about your resolution and instead take some time out a few days before and reflect upon what you really want to achieve. 3) Avoid previous resolutions; deciding to re-visit a past resolution sets you up for frustration and disappointment. 4) Don’t run with the crowd and go with the usual resolutions. Instead think about what you really want out of life. 5) Break your goal into a series of steps, focusing on creating sub-goals that are concrete, measurable, and time-based. 6) Tell your friends and family about your goals, thus increasing the fear of failure and eliciting support. 7) Regularly remind yourself of the benefits associated with achieving your goals by creating a checklist of how life would be better once you obtain your aim. 8) Give yourself a small reward whenever you achieve a sub-goal, thus maintaining motivation and a sense of progress. 9) Make your plans and progress concrete by keeping a handwritten journal, completing a computer spreadsheet or covering a notice board with graphs or pictures. 10) Expect to revert to your old habits from time to time. Treat any failure as a temporary set-back rather than a reason to give up altogether. Oh, and if you want to utilise the power of visualisation…. Here are 10 of my favourite puzzles. The answers are below – see how many you can solve and post your score below (be honest!). Good luck…. 1) A rope ladder is hanging over the side of a ship, with the bottom rung just touching the water. The rungs are 25com apart. How many rungs will be under the water when the tide has risen 1 metre? 2) How many calendar months have 28 days? 3) If you are running in a marathon and you overtake the person in second position, what position are you in? 4) I have many keys but few locks. I have space but no room. You can enter, but you cannot come in. What am I? 5) You enter a dark house in the middle of the night. Inside is an oil lamp, a gas fire and a stove full of wood. You only have one match. What do you light first? 6) What gets wetter as it dries? 7) What is as light as a feather, but even the strongest man cannot hold it for more than a few minutes. 8) What sport begins with a ‘T’ and has 4 letters? 9) What occurs once in every minute, twice in every moment, yet never in a thousand years? 10) The maker does not need it, the buyer does not want to use it, and the user doesn’t see it. What is it? And just before we get to the answers, here is a picture of my new book, 101 Bets You Will Always Win, which has lots more puzzles. Just thought I would mention it. Anyway, here are the answers…. None. The ship will rise with the tide! A coffinAnd remember to post your score! The lovely folks at Google Making & Science recently asked me whether there was a science-based project that I would love to make happen. A few weeks before, magic consultant David Britland had drawn my attention to a little-known optical illusion from the 1920s called ‘The Transparent Man’. The illusion was described in a book written by magician Robert Harbin, and involved just a few sheets of glass and a light. According to Harbin, if everything was arranged in a certain way, a person would appear transparent. It’s an amazing idea, yet no-one had actually built the illusion to see if it worked. When I looked at the plans, I realised that Harbin’s illusion used the same general idea that’s currently employed by physicists trying to make objects invisible! I contacted the world’s leading expert on invisibility – Professor Ulf Leonhardt – and asked if he would like to be involved in the project. Ulf was amazingly generous and recorded an interview about this little-known optical illusion, his research into invisibility, and how Harbin’s illusion was years ahead of its time. In addition, magician Scott Penrose (President of The Magic Circle and a huge fan of Harbin) kindly agreed to be interviewed about Harbin’s most famous creation – the Zig Zag Lady. The illusion took a long time to get right because it is a bit of an optical nightmare, but eventually the Quirkology Ninja and I managed to pull it off. And here are the related interviews by Ulf and Scott…. Loads of people were kind enough to help with the project, and so my thanks go to…Professor Caroline Watt, David Britland, Professor Ulf Leonhardt, Joe Pavlo (I still have no idea how you did that), Mat White, Scott Penrose, Darren Martin, The Magic Circle, Jim Steinmeyer, Cameron Watt, Peter Lamont, Helen Keen, Simon Gage, and Sarah Angliss. Creepy Halloween Illusion – Free! I have teamed up with the good folks at Water Closet Press and created a Quirkology goat-based Halloween illusion, and here it is…. Head over to the Quirkology site to download the free PDF (click here). We have just launched a Quirkology Mind Games set! For the past year I have been working with the good folks at Marvin’s Magic to create a Quirkology box of goodies. The exciting news is that today we are launching Mind Games at the QED conference and online everywhere. The set is crammed full of jaw-dropping illusions, surprising science stunts, and bets that you will always win. And all with a quirky twist. Within a few moments of opening the box you will appear to move objects with the power of your mind, transform anyone into a zombie, defy gravity and lots lots more. The box contains everything you need to astound your friends and family, and even has a specially filmed Quirkology DVD. Have fun! Available at Amazon UK UK here. Available in the UK, US, Europe and Canada here. With huge thanks to Marvin’s Magic, Water Closet Press and QED. A little pile of (mostly unwanted) things. A few days ago I visited the Joseph Jastrow archive at the David M. Rubenstein Library (Duke University, North Carolina). Jastrow is one of my favourite psychologists, and I have frequently been inspired by his work. Born in 1863, he built America’s first psychology laboratory at the University of Wisconsin and investigated several intriguing topics, including dreams of the blind, optical illusions, and the psychology of magic. His work laid the foundations for modern-day psychology and two of his illusions – ‘Duck/Rabbit’ and ‘Boomerangs’ – still appear in most psychology textbooks. Jastrow was also passionate about popularizing science and regularly gave public lectures, wrote newspaper articles, and broadcast on the radio. I visited the archive in the hope of learning something new about his life and work. The staff were very friendly, and kindly allowed me to look through all the great man’s letters, scrapbooks and photographs. The letters provided a fascinating glimpse into Jastrow’s personal life. In one box I found a letter from Jastrow containing a light-hearted description of himself – ‘Will wear any kind of clothes and eat anything…Is a good deal of a nuisance but doesn’t mind being told so’. In another box I came across a small card tucked inside a diary. Jastrow had created a clever little joke about Hitler and typed it up – I suspect no-one had seen the joke for over 50 years. And then I came across the final letter in the archive. At first, I didn’t understand what I was looking at. The letter was dated 1944, contained a short list of Jastrow’s possessions, and asked recipients if they were interested in any of the objects. ‘A wool coat’ (‘English worsted, navy blue’), ‘4 pairs of spectacles’ (‘Can any one use the rims?’), ‘a curious collection of hand-made collar pins’, ‘a signet ring’ (‘Unsentimental though I pretend to be, I should rather like to keep it’). And then the penny dropped. Jastrow had just died. In life he investigated the dreams of Helen Keller, was a personal friend of Harry Houdini, and created a complex psychological profile of Adolf Hitler. In death Jastrow was reduced to a little pile of (mostly unwanted) things. Feeling somewhat sad, I started to look through the photographs in the archive. Once again, it was the final item that caught my eye. Right at the back of the last box was a wonderful photograph of Jastrow sitting by a radio microphone. I have never seen the image before and I think this is the first time it has been made public. I love the photograph because Jastrow looks so relaxed, absorbed and happy. He is doing what he loved to do, and did so well. Sitting there resplendent in his spectacles, collar pin and signet ring. The whole episode felt like a momento mori – a brief but striking reminder of the importance of enjoying life because soon we will all be reduced to a small pile of (mostly unwanted) things. And that’s what I learned in the Jastrow archive. Exciting news! My new book, ‘101 bets that you will always win‘ has just been published by BoxTree. It’s based on the Quirkology bets videos, and outlines endless ways to fool your friends and family. Not only that, but the book also explains the science behind many of the bets and even has a secret bet built into it! It’s hardback, gold embossed, has over 200 illustrations and usually retails at £9.99. However, for a short period of time Amazon has it for an amazing £3.99. To celebrate the launch I have produced a new ’10 bets’ video. Hope that you enjoy it! I have always been a huge fan of the Beuchet chair illusion. Created by psychologist Jean Beuchet in the 1960s, this wonderful illusion is used all over the world to make people appear to be tiny. There is, however, one small problem from a practical perspective. The illusion involves building a large chair back and seat, and a carefully crafted chair base. When I was working on items for the Quirkology exhibition I wondered whether it might be possible to create a much simpler, and more portable, version of the illusion. After endless trial and error I realised that the same effect could be created with a small cut out of a chair and a piece of cloth! Here is my chair in action and a reveal showing the size of the chair. It took a huge amount of time to create just the right shape of chair, but the illusion works well, can be made for just a few pounds, and is ultra-portable. I have used it several times and if you want to re-create the piece for a project, feel free to get in touch! Want to be levitated by David Copperfield, see one of the world’s greatest optical illusions, or be attacked by a giant monster? Then head over to our new Quirkology exhibition at the Museum of Childhood in Edinburgh, Scotland. The exhibition allows visitors to experience the impossible, and features several unique items. Master magician David Copperfield has invented an optical illusion in which he appears to levitate visitors, and has kindly allowed us to be the first exhibition in Britain to stage the piece. In another first, famous Japanese illusion inventor Kokichi Sugihara has granted us special permission to exhibit his latest creation, ‘Rectangles and Circles’. This illusion is currently taking the Internet by storm, and shows several 3D rectangles that transform into circles when reflected in a mirror. The Quirkology exhibition is the only place in the world where visitors can experience Sugihara’s amazing creation live. interactive video show, classic illusions, a goat that appears to follow visitors around the room, and fun photo opportunities for all ages. The exhibition runs until 1 September 2016 at Edinburgh’s Museum of Childhood on the Royal Mile. Admission free. In addition to the exhibition, visitors can participate in a special Quirkology trail throughout the museum. And the whole exhibition fits on a USB stick, which allows any science centre, museum or school to reproduce it! Photo credits: Gordon Rutter, Kenny Mathieson, Richard Wiseman. With thanks to: David Britland, David Copperfield, Kokichi Sugihara, Water Closet Press and Caroline Watt. We have just filmed a new Quirkology video! It involves a miniature bear and a magic trick – enjoy…. Want to get the perfect sleep? Tonight we are staging a mass participation study to help people get a good nights sleep. It is free to join in, and we hope that lots of people will take part. All you have to do is click this link and follow the instructions…..
10 new and amazing illusions! We have just released another Quirkology video containing 10 more optical illusions! Hope you like it…. 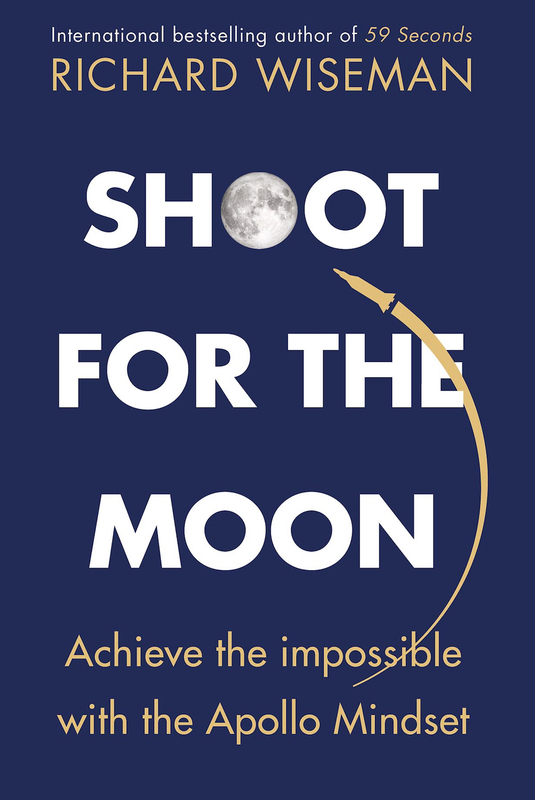 Explore the mindset that took us to the Moon, and discover how you can use it achieve the impossible in your own life!